Gyrometric technology functions on a wide range of sensor systems. Size range is shafts from 20 mm diameter to several metres. 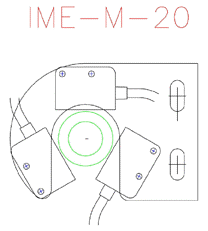 In special, (enclosed) circumstances IME optical read systems have been built for shafts as small as 10mm diameter. Smallest unenclosed (20mm) shown below. Monitoring read sensing systems for large shafts usually consist of laser cut toothed disks clamped to the shaft in two halves, the teeth being sensed by inductive, or magnetic sensors as they rotate. Gyrometric Systems offer a design service for fitting read systems into most circumstances.